Dr Crokes and Corofin both booked All-Ireland club semi-final spots yesterday. John Payne captained Dr Crokes while Micheal Lundy and Kieran McGrath are the Corofin joint captains. FAMILIAR FACES ON the victory podiums in Munster and Connacht. The two provinces both concluded senior club football matters yesterday afternoon. There was a sense of business as usual in the Gaelic Grounds and at MacHale Park. In Limerick the 2017 All-Ireland champions Dr Crokes motored away to the Munster accolade with a controlled performance against Miltown Malbay that delivered a nine-point win. In Castlebar the 2018 All-Ireland kingpins Corofin had to work that bit harder after a tricky opening against Ballintubber but drew on all of their nous to triumph. It was not the type of day to spark wild hysteria in either camp. No breakthroughs achieved, merely the continuation of the efficiency and success that they have become accustomed to. Box ticked, time to start thinking about the bigger challenges that lie ahead. The club game at this time of the year zones in on the tales of novelty and romance but in football there are clubs who represent relentless excellence and are starting to move clear of those around them. The runs that Dr Crokes and Corofin are currently on are remarkable. Dr Crokes recently completed three-in-a-row in Kerry and have seven crowns to their name since 2010. They have contested a Munster final in each of those seven seasons, yesterday’s victory landing them their fifth title in that time frame. The All-Ireland win in March last year was the culmination of all their work. Corofin claimed a sixth title on the spin in Galway this autumn. They have been the last team standing in ten of the last 13 county finals. Since 2008 they have won six Connacht crowns and contested another two finals. They retained the title for the first time last year and embellished that feat by achieving three-in-a-row yesterday. All-Ireland wins in 2015 and 2018 have elevated this era for them. The pair seem no longer sated with exploits within their county boundaries. Dr Crokes went clear of Austin Stacks in the Kerry roll of honour this season and while Nemo Rangers are still the clear market leaders in Munster, the Lewis Road club have emerged in second place with eight to their credit. 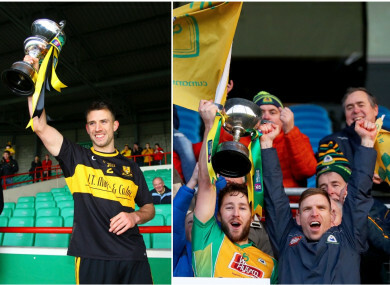 Corofin are now joint second on the roll of honour in Galway, five short of Tuam Stars who last won in 1994, and top of the pile in Connacht. They have suffered their disappointing defeats, Dr Crokes soundly beaten by Nemo last year and Corofin ousted by Castlebar in 2015, yet each time they rebound in style. These modern periods are golden ones for their pair. One of the most striking aspects is the strength of their reserves. Dr Crokes announced over the weekend that they plan to field a third team in 2019, Corofin’s second-string won the Galway junior recently and will graduate to intermediate ranks next season. Following an Executive Meeting on Monday night and a players meeting this evening, the Club have decided to enter a 3rd Senior Team in the Kerry County League for 2019. And yesterday the depth of their flagship teams was graphically illustrated. Corofin introduced 2018 All-Star Ian Burke to help turn the game their way with a haul of 1-1. They had coped without him and Daithi Burke for their semi-final against Clann na nGael, still runaway victors at the end by 27 points. Dr Crokes began yesterday with seven players on the bench who have collected All-Ireland medals on Kerry teams. Colm Cooper’s county career is well-documented but Alan O’Sullivan (U21 2007), Jordan Kiely (minor 2014), David Naughten (minor 2016) and Michael Potts (minor 2016 and 2017) have all tasted national glory. At least they got cameos during the second half yesterday. Eoin Brosnan, with a celebrated senior career behind him, and Billy Courtney, a two-time Kerry All-Ireland minor winner, remained on the sideline. And it’s interesting how they keep replenishing their sides as new stars burst to the fore. Kieran Molloy was outstanding for Corofin in their Connacht final victory, when they triumphed in Croke Park in 2015 he was not involved. The trio of Micheál Burns, Tony Brosnan and David Shaw struck 1-10 between them for Dr Crokes in the Gaelic Grounds. None of them started on St Patrick’s Day in 2017 and Shaw was not even in the squad. As 2018 closes, they will be favourites to set up a final clash against each other in 2019. Their two previous meetings in semi-finals in 1992 and 2017 swung the way of Dr Crokes but they have yet to cross paths in a decider. Pointing out their credentials is not to dismiss the others in contention. Next Sunday’s Ulster final will be a landmark one for Gaoth Dobhair spearheaded by the McGee brothers, the experience of Kevin Cassidy and the majesty of Odhran MacNiallais. Their opponents Scotstown are anchored by the best goalkeeper in the country this year in Rory Beggan, the Hughes brothers and a livewire forward in Conor McCarthy. The Leinster showdown on Sunday week sees Kilmacud Crokes in action, a team that have looked exceptionally dynamic and well-drilled in recent weeks and in possession of a game changer in Paul Mannion. The journey of Longford’s Mullinalaghta to this stage has been wondrous as they have belied their small pool of players to progress impressively. And yet it is the Kerry and Galway champions that are the first two sides to have secured a passage to the 2019 All-Ireland senior semi-final stage. Both Dr Crokes and Corofin have produced such dazzling displays that they are entitled to be considering a St Patrick’s Day assignment. They have a combined aggregate win of 77 points in their provincial outings against the champions of Tipperary, Cork, Roscommon, Clare and Mayo. A pair of super clubs in control of their counties and provinces. Right now they look the two leading club football teams in the country. And the opponents they have dismissed ruthlessly in recent weeks will attest to that. Email “Super clubs and star players - 29 major football titles for Kerry and Galway kingpins over the last decade”. Feedback on “Super clubs and star players - 29 major football titles for Kerry and Galway kingpins over the last decade”.